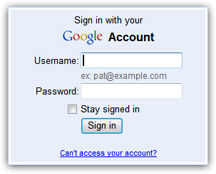 The previous tutorials explained Gmail Sign in in details, and how Gmail login worked behind the scenes for your security: in this tutorial, you will learn about Gmail Sign out, or the process that instructs Google to exit your emails and other accounts (remember, the credentials you use for Gmail are a single-sign-in solution for all other Google services you may be using: if your sign out of one, you typically logout of all of them in that web browser). Finally, we'll show you how to clear traces of your login information after you have successfully signed out of your account. Type "www.gmail.com" in your browser's address bar and hit Enter: one of two things will happen: if you see the Gmail sign in form, it means that you are already signed out (you do not need to do anything else, in other words). Seeing the blank sign in form (screenshot ↑), means that you are already signed out. But, if you are automatically redirected to your inbox, this means that your last settings were to "Stay signed in" - in which case you will need to manually logout. Otherwise, anyone who accesses any Google service from that browser, or Gmail itself, will be automatically in your account or inbox! To force a (manual) logout, look in the top right corner of any Gmail screen: you will see a series of links, the last of which reads "Sign out" - click on it, and you will be redirected to the standard Gmail Sign in form (pictured above). This is your visual confirmation that you are completely logged out of your account. Clicking on the "Sign out" link should be the end of it; but, as a security measure, confirm your logout status: type www.gmail.com in your browser's address bar and hit Enter (or Return on a Mac), and see if you still get the blank Sign in form (you should, and if you do, this confirms that you have been signed out). Tip: keep in mind that your Gmail user name / email address will be added again to your web browser's autocomplete database the next time you login to check your emails, unless you disable the feature altogether.